getting involved and spreading the HHF word! We love all kinds of participation! Financial donations are critical to be able to sustain the HHFL children and our mission. But here’s the good news. If you can’t afford to give, there is still a place for you at HHF! Gift us your time and energy by helping to raise funds in your community. And if you are strapped for time and energy, don’t give up. Simply gift us your voice and spread the HHF word to everyone you know! We genuinely believe there is value in every effort – big and small – because we recognize that often a collection small efforts can lead to great change. Give whatever support you can provide – it’s always worth it! 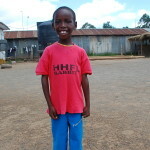 Help educate, empower and care for the HHFL children and youth with sponsorships and donations. Be an HHF champion and help us raise funds in your community, schools and workplace. Spread the HHF word and share our wonderful stories with everyone you know!